Supermarkets and hardware stores: love them or hate them, these stores are everywhere. You can often find huge aisles dedicated to pest control products here, which treat all types of different insects, including bees, ants, roaches, and mosquitoes. While they often cost less than $7 per spray, and do seem convenient, this may not be the best place to purchase your bed bug sprays and powders. Bed bug sprays found in local hardware stores and supermarkets mainly consist of outdated pesticide formulas. These were once very popular among pest control professionals, but have since lost much of their effectiveness due to how rapidly bed bugs can build resistance to toxins that they’re exposed to. Since chemical companies invested so much research and development into each formula, they don’t want to completely scrap a less effective formula in place of a newer one. Instead, they often sell these products directly to consumer-based retailers at a value price. This is why most people who attempt a bed bug treatment themselves using these inexpensive store-bought “bed bug sprays” often fail. 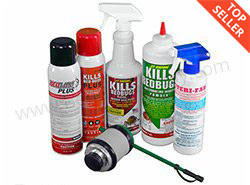 Fortunately, you can find the same sprays and powders that professionals use by shopping online or by searching for niche pest supply stores. These sources provide anyone with the ability to tackle an infestation by following an integrated pest management approach, including the use of encasements, steamers, and monitors. However, professional sprays can cost considerably more than inexpensive and outdated sprays found in local stores. This is because chemical companies like to recoup much of their R&D expenses in the first few years of a new formula’s launch, bringing the cost up for professional formulations that haven’t yet encountered resistance. Although more expensive, it’s a small price to pay for a much greater chance that your bed bug treatment will succeed. When most homeowners encounter a pest problem, they reach for one of many popular “bug bombs” or “foggers“. Unfortunately, these bombs have been found to be largely ineffective against bed bugs: an Ohio State University study showed that most major bug bomb brands have a very poor success rate in killing bed bugs. This is due to how the insecticide in a bug bomb reaches its target. Bug bombs work by filling an open space with insecticide gas, killing insects that inhale it. This may work for bugs that spend most of their time in open terrain, but bed bugs are much less often found in open space – they prefer to tuck away in tight spaces where they won’t be disturbed between meals. A gas that isn’t directly injected into these areas isn’t going to penetrate effectively, meaning your bed bugs might be out of the chemicals’ range. In order to kill bed bugs, an insecticide needs to be applied where they are most likely to be active. Contact sprays that are applied to beds and furniture are likely to cut down the population, while residual sprays and powders can be laid down on cracks and crevices throughout a room to kill bed bugs that come out of their hiding places. Be wary of store-bought bed bug sprays claiming to be all-natural or EPA “exempt”. Ingredients that are outside of the jurisdiction of the EPA usually have no insecticidal properties, and are often not fully tested; this means that they could have no effect at all against bed bugs. This is why Bed Bug Supply only carries EPA-certified bed bug sprays, which have been fully tested to ensure that they will work as intended. Despite the occasional FTC action against deceptive advertisers, there’s little stopping EPA exempt spray companies from selling you a cheap bed bug solution that they promise will work, despite the product never going through any certification or lab trials. These products are commonly made from natural oils, claiming to be an environmentally friendly alternative to “harmful pesticides”. When a product is EPA exempt, it’s normally because the ingredients used are not actually insecticides, and are often never tested against bed bugs in a scientific environment. Can cedar oil kill bed bugs? Sometimes, yes. But so can alcohol. Or your shoe. When you buy professional-strength products, you’re not just getting something that can kill bed bugs – you’re getting something that kills most, if not all of them. Cutting down a small portion of an infestation does nothing; to solve the problem, you need to eliminate the population completely. That’s what our professional-strength treatment process is for. Unfortunately, there are no cheap and easy shortcuts with bed bugs. Your supermarket doesn’t have the solution for your bed bug infestation. Bed bugs are a tough foe to conquer, and you need a professional-strength, professionally proven solution using multiple products and techniques. Get rid of bed bugs like the pros with our professional-strength powders and sprays. All of our sprays and powders are EPA registered and include free shipping.